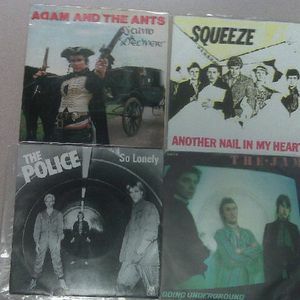 The Police, Squeeze, The Jam and Adam and the Ants. Coral and I did some record shopping on the weekend. We hit the new Talk&apos;s Cheap store on Pandora at Government Street. In the old Regalia Store space. He has tons of greats 45s and Coral and I are always looking for some more dance party hits for our vinyl sets so I loaded up on some UK chart toppers of the early 80s.